Gartbreck distillery: is there still hope? Three years after planning permission was granted for a single malt whisky distillery on Islay’s Gartbreck Farm, the project appears to have been killed off by a disagreement between Gartbreck owner Jean Donnay and independent bottler Hunter Laing. But how did we get here? And what happens next? Dave Broom tells the full story. In January 2014, Jean Donnay, owner of Glann ar Mor distillery in Brittany, secured planning permission to convert Gartbreck Farm on Islay into a 120,000 litres pure alcohol (lpa) distillery with its own malting floor and kiln, with the potential to supply about 20% of its needs from Islay-grown barley. Later that year, he began seeking additional investment for the plan. After one potential deal fell through, Donnay approached other parties and, by early 2015, had reached an agreement with independent bottler Hunter Laing, with whom he had traded (when the firm was still part of Douglas Laing) for 20 years. The deal would see the Glasgow firm buy the project outright, with Donnay relinquishing his shareholding, but being retained as a consultant while the distillery was being commissioned. Although no contract was signed, both parties worked under a Heads of Agreement, according to which it would be standard practice for them to incur their own expenses pending the signing of a final contract. By this point, the original plans for the distillery had changed. Hunter Laing wanted capacity to rise to 190,000 lpa, while Donnay had realised that an on-site warehouse would be required, along with parking for visitors. 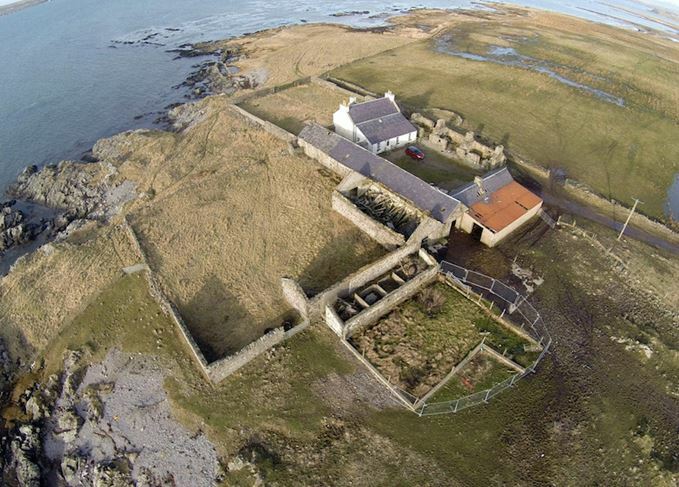 He had earmarked a strip of land which runs around three sides of the property, and spoken to the landowner, Islay Estates, with a view to purchase. It is understood that Donnay told Hunter Laing that it would be pointless for him to buy the land, but would make more sense for the company to do the deal with Islay Estates after the contract was signed. In the subsequent months, both parties began work. Donnay travelled to Islay and Europe to liaise with suppliers, while Hunter Laing independently began to demolish the site’s old farm buildings. Although Donnay questioned some of the clauses in the final contract at a meeting with Hunter Laing in Glasgow on 6 July 2015, it is understood that there was no major disagreement. Both parties went to Islay on the following day to view the site and to meet the architect and contractors. The next week, for reasons which he has declined to disclose, Donnay pulled out of the deal. He then contacted Islay Estates to say he would now be buying the land, only to be told that it had been sold to Hunter Laing on 6 July. The deal now off, Donnay offered to buy back the land from Hunter Laing for the price the company had paid for it. This was rejected, Hunter Laing arguing that some form of financial compensation was due, given the work it had carried out on the site. In the interim, Donnay modified the plans for Gartbreck and approached other potential investors. They, however, felt that the distillery was not workable without the strip of land now owned by Hunter Laing. A second offer was made. While the full details have not been revealed, it is understood that Donnay offered to compensate Hunter Laing for the cost of the demolition work, and to waive his expenses. It was at this point that Donnay told Scotchwhisky.com that the project was dead, but that he was willing to meet to try to resolve the issue. Meanwhile, Hunter Laing managing director Stewart Laing told us: ‘We’re happy to consider offers for the property that are in line with our valuation, at which point meetings with any prospective buyers would be worthwhile.’ This appears to contradict the position set out in the letter to Donnay. The matter rests upon two different interpretations of the word ‘tenable’. Undoubtedly the distillery could function as a production plant without on-site warehousing or car parking. On this reading it is tenable as a production unit. Whether it could work as a business is another matter. While a distillery ultimately succeeds or fails through selling its whisky, tourism can help to offset some of the running costs, particularly in its early days. A distillery with no access for visitors would lose that potential source of revenue. Having a warehouse on site is not strictly necessary either, but makes logistical sense. Building one elsewhere involves buying more land, or renting from another distillery – provided it has space available. In time, more warehousing will be needed. Expansion is, or should be, part of the plans for any new build. Seen from this perspective, it is hard to see how Gartbreck could be tenable as a business. In our analysis, this would be the deal-breaker for any new investors. The strip of land at issue is too small to use as a building plot and only has a useful function when it is part of the farm (which is closed) or part of the distillery. Hunter Laing has emphasised that ‘we are not in the business of blocking the building of distilleries’, but it is hard to avoid the interpretation that this is exactly what has happened – deliberately or not. The matter is complicated further by Hunter Laing’s construction of Ardnahoe distillery on Islay’s east coast, which is expected to open next year, overtaking Gartbreck to become Islay’s ninth single malt whisky distillery. As the dispute rumbled on, Scotchwhisky.com approached both companies in early July with a range of supplementary questions, but both declined to answer them. We can only hope that this means that talks are now under way to revive the project. Building a distillery would bring much-needed jobs to the island. There were 13 people, 11 of them full-time, planned to be employed when Gartbreck became operational. That is what both parties have to consider. Who is to blame for the Gartbreck conundrum? That’s not for Scotchwhisky.com to say, but one thing is certain: for this dispute to be resolved, a certain amount of pride has to be swallowed on both sides. Having one new distillery on Islay is good news for the community. Having two, surely, is even better.